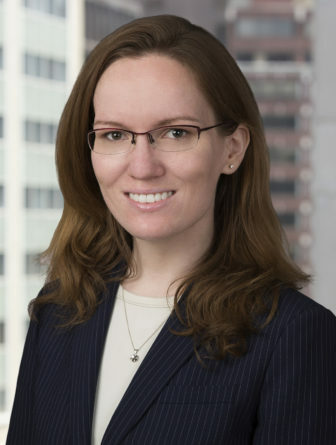 Lanora Pettit is a litigator whose practice has focused on complex civil litigation, particularly in the areas of securities fraud and shareholder derivative litigation. Before joining Robbins, Russell, Englert, Orseck, Untereiner, & Sauber, LLP in 2014, Ms. Pettit worked as an associate in the New York office of Sullivan & Cromwell LLP. Ms. Pettit also served as a law clerk to the Honorable Diarmuid F. O’Scannlain and the Honorable Robert R. Beezer of the U.S Court of Appeals for the Ninth Circuit. Note, Cincinnatus or Caesar: American Czars and the Appointments Clause, 26 J. L. & Politics 81 (2010). Defending two major healthcare companies, two major banks and a national clothing retailer in separate securities class actions and derivative shareholder actions premised on violations of federal regulation, national safety standards and accounting standards. Representing main group of holders of general-obligation bonds in the first restructuring for a state-level government against the Commonwealth of Puerto Rico and instrumentalities thereof. Representing first-lien bank lenders and their agent, Credit Suisse in certain litigation matters related to and arising in the bankruptcy of Caesars Entertainment Operating Company, Inc. Representing individual employees and executives in investigations by the United States Department of Justice in cases involving allegations of securities and wire fraud as well as other potential criminal offenses; no action taken against clients. Advising special situation investors about litigation outcomes, including litigation risk posed by potential transactions. Representing a major electronics manufacturer in common law claims based on patent infringement abroad.